founded the Harriet Tubman Home. refusing to assist in tying up a man who had attempted escape. years later, fearing she would be sold South, she made her escape. was put into a wagon, covered with a sack, and driven to her next destination. 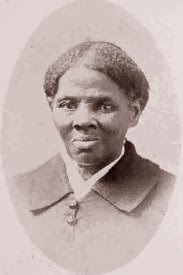 Anti-Slavery Society, she learned about the workings of the UGRR. BME Church on Geneva Street. out, but do not yet know the expense…. the slaves, she was without her equal. was never known before or since. the home of US Senator and former New York State Governor William H. Seward. the road aiding fugitives from slavery, and speaking in support of the cause. as a result of the head injury she sustained as a child. for the Resident Manager of the Harriet Tubman Home. before her death in 1913.
bearing her name and likeness. Resident Manager of the Harriet Tubman Home. to 15 persons were housed there. ordered demolished by the city in 1944.
pictured at right in the photo, and a large assembly hall, visible at left. now on display in the Home.